Suruga Province　駿河 and Izu Province　伊豆.
. Mount Fuji 富士山 Fujisan Fujiyama .
. Yui no takarabune 由比の宝舟 "treasure ship" from Yui village .
. Fuji Tengu 富士天狗（富士太郎）Tengu from Mount Fuji .
. Reiken Jinja 霊犬神社 "Dog Shrine" amulets .
. Shizuoka hariko 静岡張り子 papermachee dolls .
. Hamamatsu tako 浜松凧 kite from Hamamatsu .
. Hamakita no kazaguruma 浜北の風車 windwheel from Hamakita .
. tsurushibina 吊るし雛 small hanging hina dolls . o-kata, honorable lady, is an aristocratic lady. 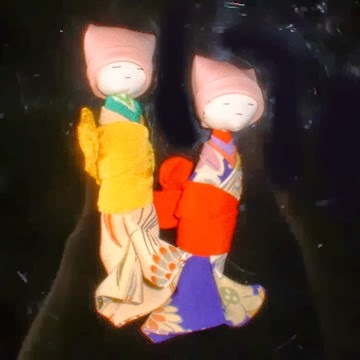 This hanging doll is depicted in the robes of a bride with the wish that the girl might marry into a good and rich family and become very happy.
. Kanaya tsuchi ningyo 金谷土人形 clay dolls from Kanaya .
. origami shinzoo 折紙神像 god figures from folded paper .
. Ishimatsu ningyoo 石松人形 dolls of Ishimatsu . and Daruma like Ishimatsu and his yakuza boss, Shimizu no Jirocho.
. Daikoku Daruma 大黒だるま .
. Mori no bukadako, tako 森のぶか凧 kite . Made by 高木家、山田家 the families of Takagi and Yamada since about 1860. 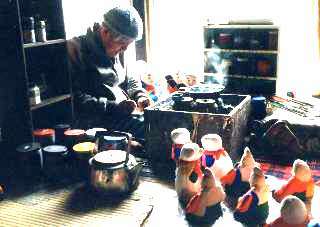 高木弥左エ門 Takagi Yazaemon was the first, but the family Takagi stopped in 1935, Yamada in 1938.
yakibina 焼き雛 "pottery dolls" in the local dialect. 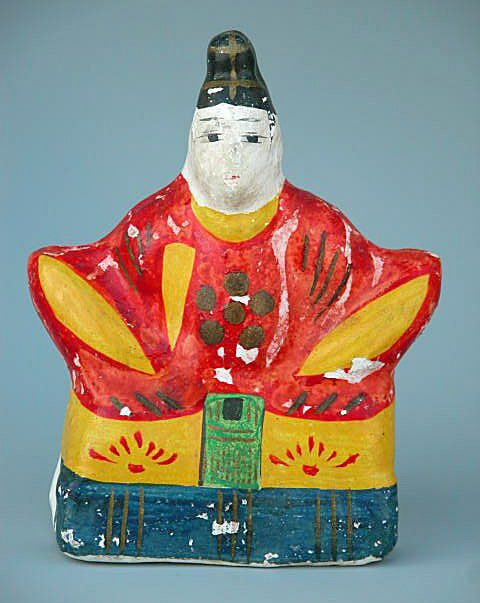 Kamejiro had moved to Hokkaido and then came back to his hometown in 1999, to revive the doll making.
. Munadaka tako 宗高凧 kite from Munadaka village . Ichiron is the name of a shop. 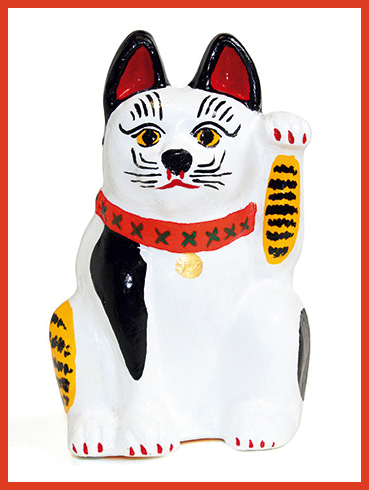 The first owner was Horio Ichirozaemon 堀尾市郎右衛門, today the shop is in the 5th generation. 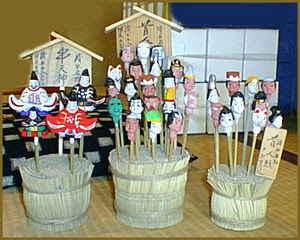 The themes of his dolls are related to the lord Minamoto no Tametomo 源為朝 (1139 - 1177). The first Ichiron set up his shop on the old Tokaido, where samurai were passing from Kyoto to Edo. 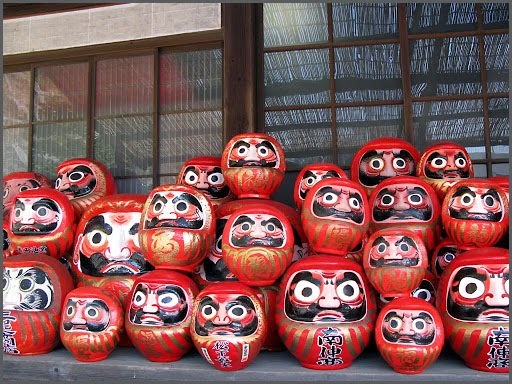 The faces of his samurai dolls looked much like the "real men", because he made them with all his prayers for the samurai and offered them at the shrine Yamanashi Kasamori Inari jinja 月見里笠森稲荷神社.
. Kasamori Inari Fox Shrines . 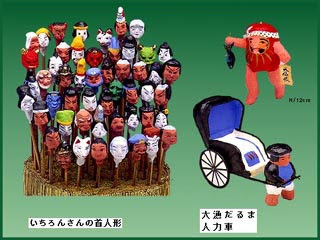 Ichironsan produced head dolls in two sizes, small and large. The shop also sells other papermachee dolls and Daruma dolls.
. Kubi ningyoo 首人形 head dolls INFO .
. Shimizu Daruma 清水だるま .
. Ikawa no ogi tako 井川の扇凧 handfan kite from Ikawa village .
. Shizuoka anesama 静岡姉様 elder sister doll .
. iwaidai, iwai no tai 祝い鯛 sea bream for celebrations .
. hige Daruma ひげだるま Daruma with a beard . A piece of young bamboo was used to make it, and families can make it themselves. The thinly cut part was painted with red or purple. 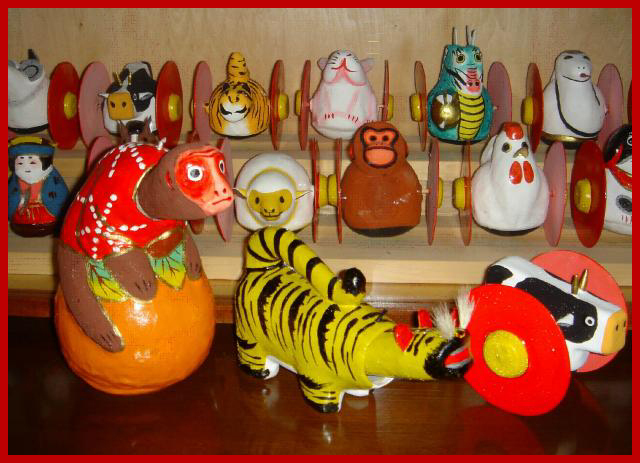 It is ment to ward off evil and kept in the Shinto house altar, but children may also use it as a toy. Girls use it to comb their hair. Boys use it as a weapon in their war games. 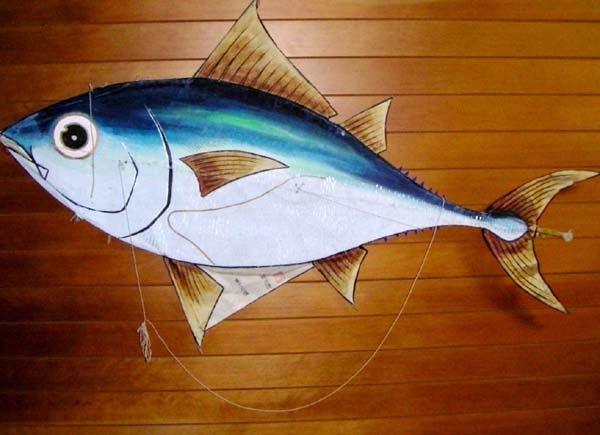 The name derives from a local pronounciation, osagekami おさげかみ, to have your hair hang down. At the temple Tokei-In 洞慶院 (Tookeiin) it was sold in stalls on the celebrations of the founder, on July 19 and 20. 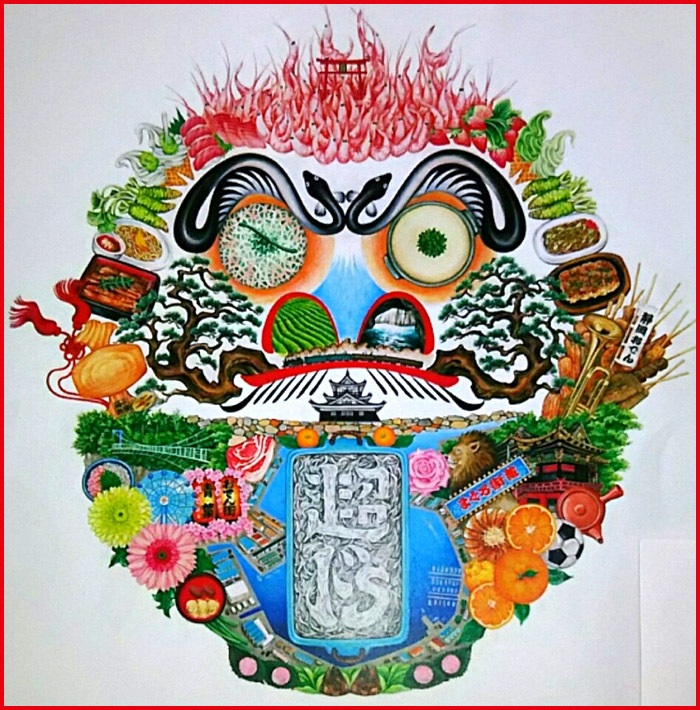 People bought it as a talisman to stay healthy during the summer months, for good business of lodgings and restaurants and for artists to prosper. They displayed it at the cashier place of their business in the hope to attract "ten thousand visitors" 千客万来.
. iwaibo, fertility stick .
. ebi　えび　/　海老　/ 蝦 lobster, prawn, shrimp .
. Suruga takezaiku 駿河竹細工 Suruga bamboo basketry . 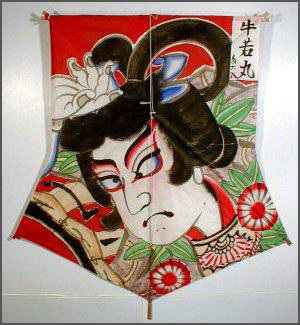 This dates back to the local regent Imagawa Yoshimoto, who flew this kite over his Suruga castle.
. Imagawa Yoshimoto 今川義元 (1519 – 1560) .
. Ushiwakamaru Minamoto no Yoshitsune 源の義経 (1159 - 1189) .
. tanukiguruma 狸車 tanuki badger with wheels . Shizuoka turnery is woodwork handed down in Shizuoka Pref. The turnery technique was first introduced to this area in 1864, when Yonekichi Sakai, a craftsman in this prefecture learned the technique from a turner in Hakone, Kanagawa Pref. 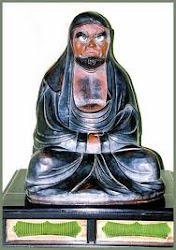 and opened his own workshop in the town of Shimogoku in present-day Shizuoka City. 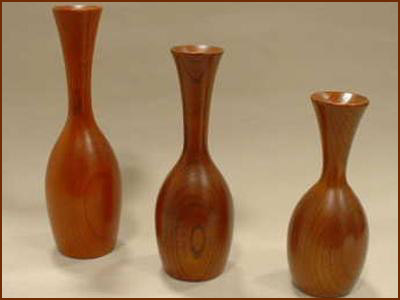 After the World War II, pepper grinders were made in large quantity to export to the U.S.A. and the area grew into a major producing center of turnery products. Now, kitchen ware, stationery, toys, furniture parts, and construction fittings are made and used in various industries. Turnery is indispensable technique to create rounded surface in woodwork, so it has been an important local industry in the prefecture. Woodwork and bamboo products made by Shizuoka turnery are favored as people’s daily necessities.
. Shuuzenji 修善寺 Shuzen-Ji .
. Hirosedako, tako 広瀬凧 kite from Hirose store .
. Suzukawa Daruma 鈴川だるま .
. Shizuoka Folk Toys - this BLOG .